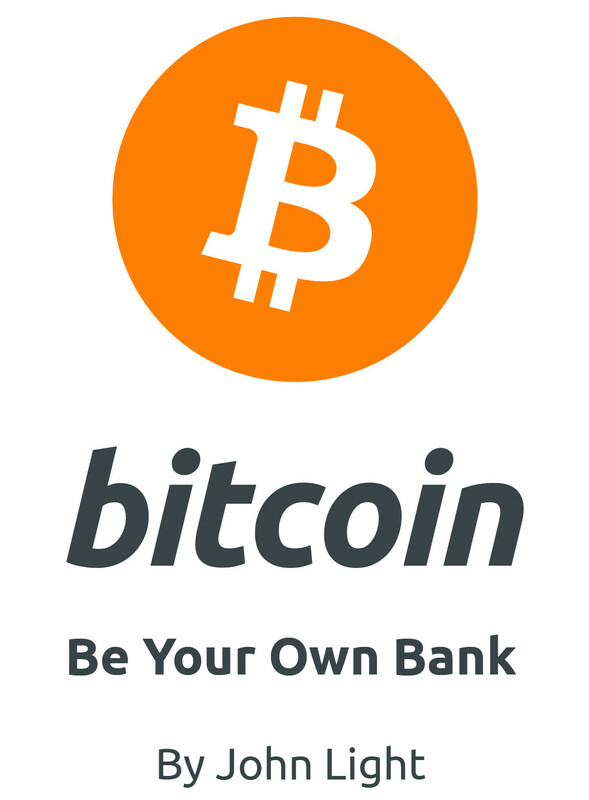 Learn how to use Bitcoin to be your own bank! Send questions or feedback here. Bitcoin is an open payment protocol that gives users the ability to transact electronically without the need for a trusted third party such as a bank or payment processor – think of it like email for money. In the same way that anyone can create an email account to send and receive email, anyone can create a bitcoin account to send and receive bitcoin. Because anyone can open an account or help process payments, no single trusted third party is capable of shutting down the network, closing accounts, or blocking payments. This makes bitcoin a potentially valuable tool for unbanked people who need a way to participate in the modern economy but for whatever reason are unable or unwilling to open a bank account. Unbanked people typically rely on a patchwork of services to approximate participation in the modern economy, using some combination of check cashing services, remittance networks, pre-paid gift cards, and mobile money, all of which are expensive and/or inconvenient to deal with. Bitcoin can provide an alternative to all of these services by providing a free account to store, send, and receive money with, enabling easy electronic transactions with anyone else who uses bitcoin. Given the increasing availability of cheap, Internet-connected smart phones and free wifi in public areas such as libraries and cafes, most people in the developed world and a growing number of people in the developing world can now bank on the blockchain. To BTC, or not to BTC? Since there is no trusted third party that controls the bitcoin network, there is also no trusted third party that pegs the price of bitcoin (abbreviated “BTC”) to a relatively stable asset like US dollars (USD). Instead, the price of bitcoin freely fluctuates based on supply and demand, which is affected by changes in the bitcoin market and the broader economy. People who want to bank on the blockchain but avoid the price volatility of bitcoin can do so using third party currencies that are pegged to familiar assets like USD. Once a holder of “blockchain USD” is ready to transfer their money, they can either send the USD directly to the recipient if they will accept it, or first convert the USD back into bitcoin and then send the bitcoin to the recipient. There are instant exchange services that make this process convenient for people who want to use bitcoin with third party currencies. Bitcoin can also be immediately exchanged for cash or stored value cards when it is received. This guide will assume you have an Android smart phone, although it is possible to use similar apps for the desktop, tablet, or iOS platforms. Most of the instructions below are only needed for a one-time set-up. After you’ve gone through these steps once, you’ll be able to quickly send and receive bitcoin. First, you need to download a bitcoin wallet. 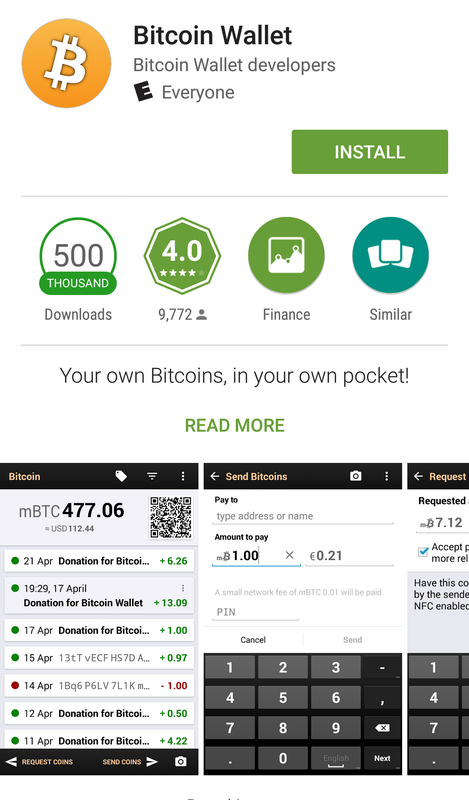 This app stores all of your bitcoin account information. 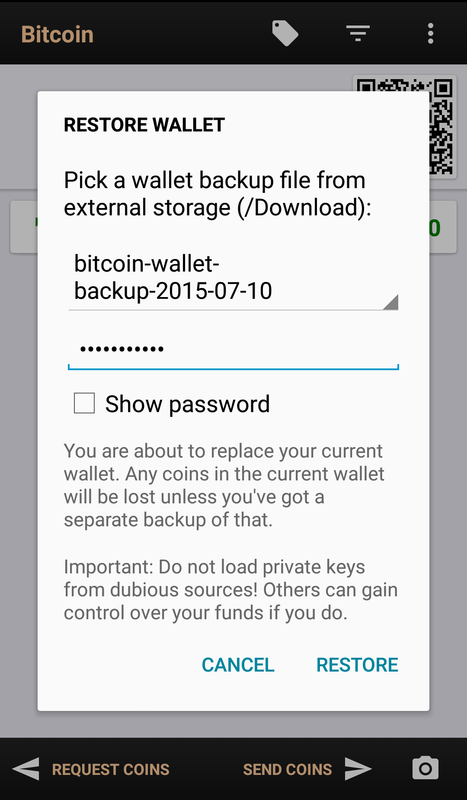 Download + install the Bitcoin Wallet app. Your bitcoin wallet will create a new account for each transaction. This is a security measure that can make it harder for thieves to compromise your account. Each account is made up of an address, which is needed to receive money, and a private key, which is needed to send money. The address starts with a “1” or a “3”, followed by a long string of letters and numbers that you can copy+paste into a payment request. This address is designed to be unique so that no one else can generate the same address and spend your money. 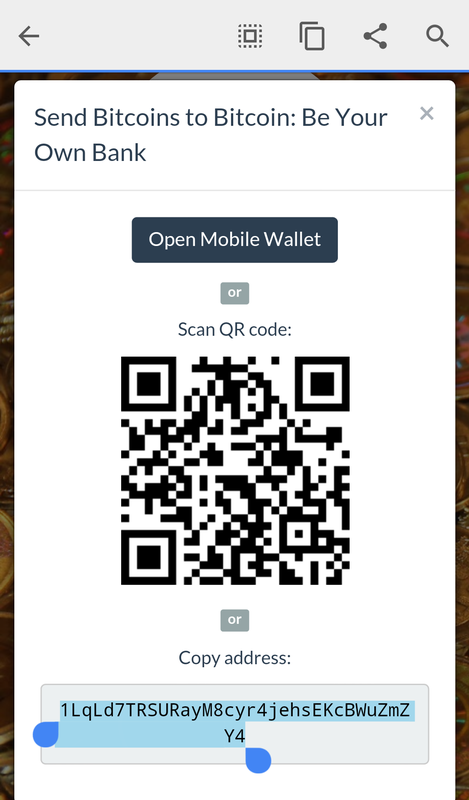 The address is also displayed as a square QR code that can be scanned by people who want to send you money with their own mobile bitcoin wallet app. 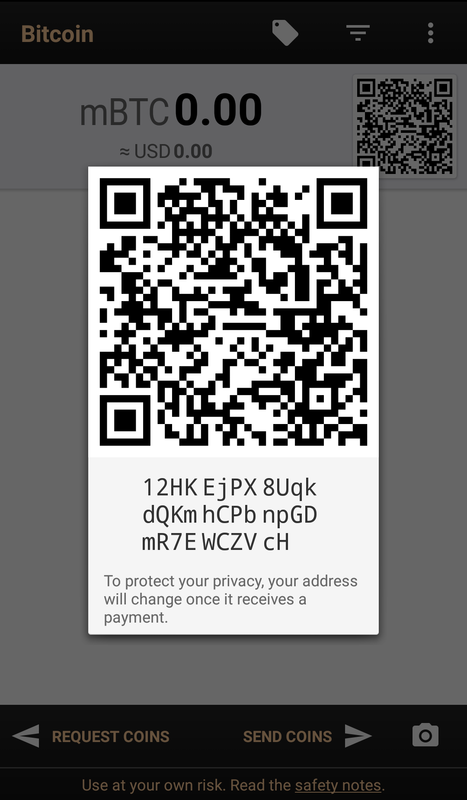 Bitcoin address and QR code. To earn bitcoin, you can create a listing on a bitcoin job board or marketplace. If you already have a customer base for your business, tell them you accept bitcoin and offer a nominal discount for paying with bitcoin e.g. 2% off. If you are employed by someone else, you can sign up for a service that will make it easy for you to get paid in BTC without any cooperation needed from your employer. To buy bitcoin with cash, you can use a marketplace like LocalBitcoins to find a well-rated trader in your area who will sell you bitcoin, or you can visit a local meetup to meet the community and see if someone is willing to trade. Set up the meeting with your trading partner in a public place with Internet like a cafe or library. Meeting bitcoin traders in person is a great way to learn from someone who is knowledgeable, and will help you secure a consistent source of bitcoin or cash when you need it. Another cash option that is increasingly viable is to find a Bitcoin Teller Machine (BTM) nearby. These machines accept cash and dispense bitcoin. Once you have bitcoin in your wallet and the transaction has at least one confirmation, you can make purchases, transfer the bitcoin into long-term storage, or send bitcoin to someone who needs money. Bitcoin can be a great way to send money to family and friends overseas. Payments are usually confirmed within an hour, and each transaction requires fees of only a few cents USD no matter how large the amount or how far the money is being sent. The recipient can then spend the bitcoin, use a local exchange to cash out the bitcoin for local currency, or save the bitcoin in their own wallet. There are over 100,000 merchants that accept bitcoin today, including gift card resellers that make it easy to spend bitcoin at stores that don’t yet accept bitcoin directly. For example, you can save as much as 20% or more on Amazon orders when you pay with bitcoin through Purse. This is just one of the many services that exists to help you save money when you use bitcoin. 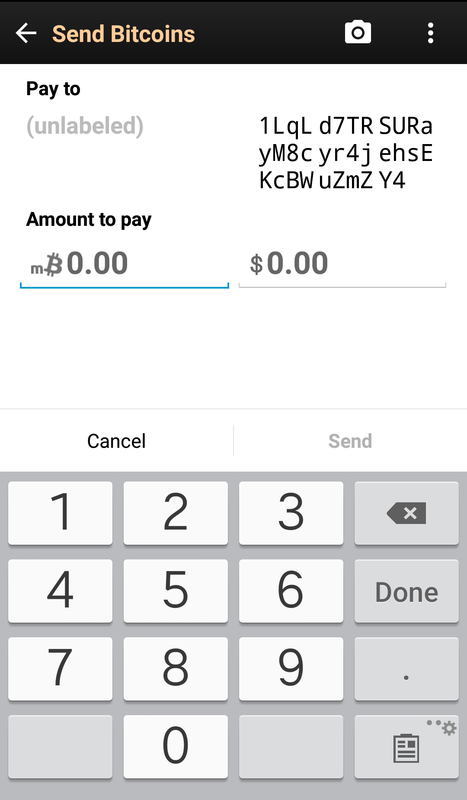 To send someone bitcoin, press “send coins” in your bitcoin wallet and either copy+paste the recipient’s address or click the camera icon to scan their QR code. Copy the recipient’s bitcoin address. Paste the recipient’s address or scan their QR code. 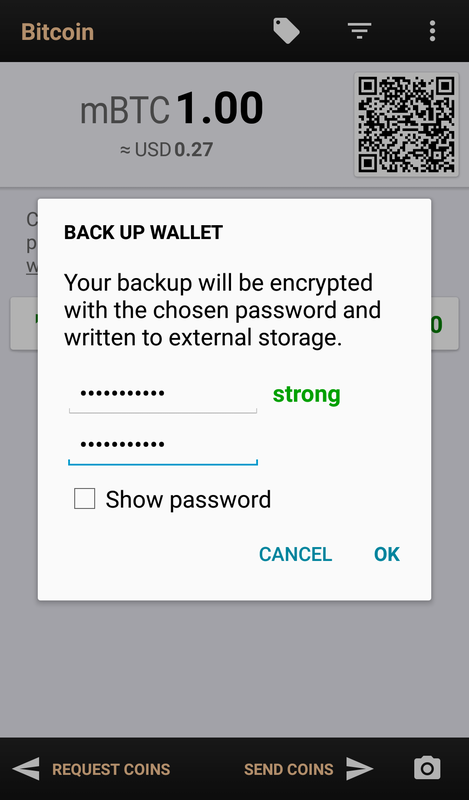 “Back up wallet” in “Safety” menu. You will be prompted to enter a password. Make it a good one, something easy for you to remember but hard for others to guess. You can use a password manager app if this helps, just know that if you lose access to your password then you will lose access to your backup. Use a password to protect your wallet back-up. You will be asked to select which back-up you want to restore. Pick the one you want, then enter the password you created when you first made your back-up copy. Then press “Restore.” Your wallet will take a few minutes to re-sync with the network, then all of your funds should be restored and your balance will be the same as it was before you lost your wallet. Try that with paper money! 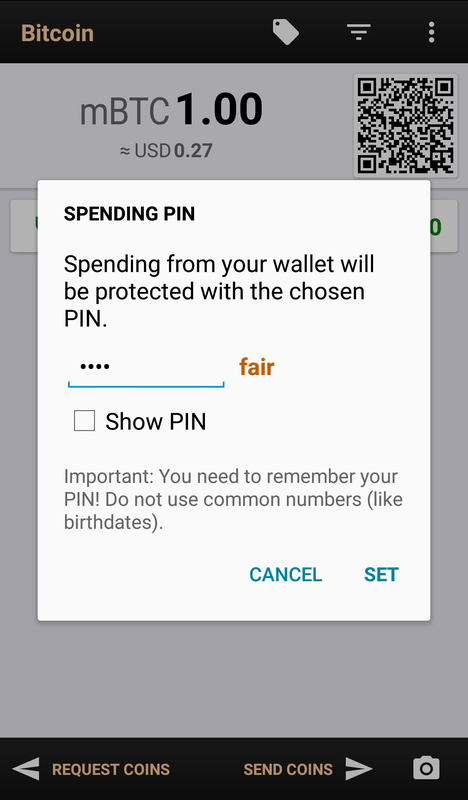 The second feature that your bitcoin wallet offers that you can use to protect your funds is the ability to set a PIN that must be entered before each send transaction. This is to protect your funds from being spent by someone who gains access to your phone. 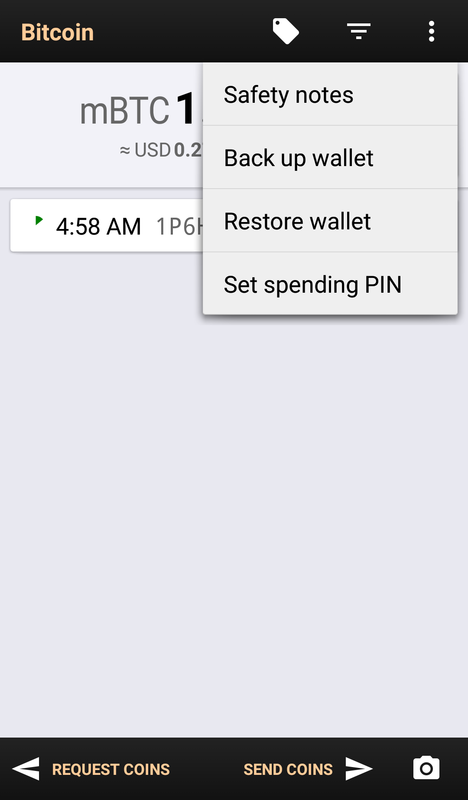 Again, navigate to the main menu in your bitcoin wallet and press the Safety button, then press “Set spending PIN.” Your PIN can be as long as you want. Just make sure you can remember it, otherwise you won’t be able to spend your money. Write down your back-up password and PIN and store the piece of paper somewhere safe where you can access it in case you lose your phone or forget your password or PIN. You can also write down a second copy of the password and PIN and give the copy to someone you trust just in case something happens to your copy. This will help prevent unnecessary and unfortunate loss of your bitcoin funds. Another feature you can use to secure your funds is the multisignature account feature. This requires the use of a different app and multiple devices, and will be covered in a future blog post. 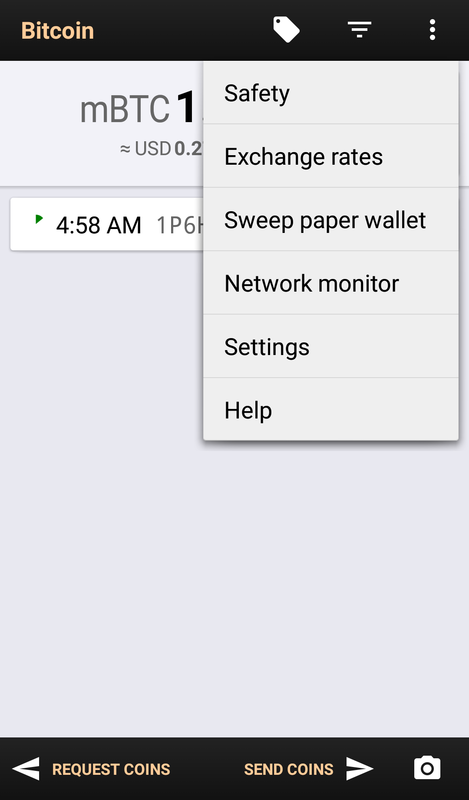 A relatively recent innovation that people are using to secure their bitcoin are hardware wallets. These are specialized devices that store bitcoin private keys offline, keeping your bitcoin safe from hackers who might install a virus on your device to try and steal your bitcoin. Hardware wallets will also be covered in a future blog post. A new world of opportunity. Bitcoin is a powerful new technology that gives anyone on the internet open access to the digital economy. Agree? Disagree? Share your ideas or questions about how bitcoin can help the unbanked in the comment section below.